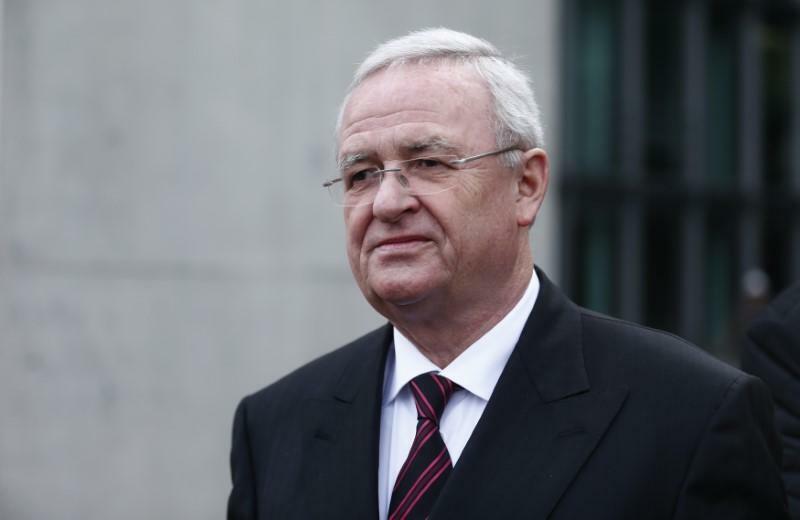 WASHINGTON (Reuters) - The U.S. Justice Department on Thursday disclosed the filing of criminal charges against former Volkswagen AG (VOWG_p.DE) Chief Executive Martin Winterkorn, accusing him of conspiring to cover up the German automaker's diesel emissions cheating. The indictment, filed in secret in March, was unsealed in U.S. District Court on Thursday as Volkswagen held its annual meeting in Germany. Winterkorn resigned days after the scandal over polluting vehicles in the United States became public in September 2015. The federal government's decisions not to prosecute senior financial industry executives in connection with the 2007-2009 financial crisis also has drawn fire from advocates of tougher measures to deter corporate wrongdoing. The U.S. indictment of Winterkorn is likely to be largely symbolic. As a German citizen, he is almost certain not to come to the United States and to seek protection under German extradition law. The former CEO is also under investigation by German authorities. Volkswagen settled criminal charges with the U.S. Justice Department in 2017 and agreed to a $4.3 billion payment. In total, VW has agreed to spend more than $25 billion in the United States to address claims from owners, environmental regulators, states and dealers. The company also has offered to buy back about 500,000 polluting U.S. vehicles. Many are now stored in parking lots around the United States. Volkswagen has been fighting to move past the emissions scandal, vowing to spend billions on a number of new electric vehicles as it has seen U.S. sales rebound. The indictment reopens the question of whether other senior VW executives knew about the scandal, which threatens to prolong the crisis. Sessions said in a statement that the charges against Winterkorn showed that "Volkswagen's scheme to cheat its legal requirements went all the way to the top of the company." The indictment describes a July 27, 2015 meeting at which Volkswagen employees presented PowerPoint slides to Winterkorn and "other senior VW AG management at an in-person meeting at VW's headquarters in Wolfsburg." The meeting provided a "clear picture" of how the company was deceiving U.S. regulators about software used to rig emissions tests of Volkswagen diesel vehicles, it said. VW's new chief executive on Thursday in Berlin, Herbert Diess, vowed to make the carmaker "more honest" as it fights to recover from the diesel emissions scandal, but wary investors called for outside vetting of steps to restore its reputation. Volkswagen had initially suggested that only lower-level executives knew of the diesel emissions cheating. But the indictment alleges Winterkorn was informed of VW’s misconduct in May 2014 and in July 2015 and he agreed with other senior VW executives "to continue to perpetrate the fraud and deceive U.S. regulators," prosecutors said. A spokeswoman for the U.S. Attorney's Office for the Eastern District of Michigan in Detroit said Winterkorn was not in custody. In total, nine people have been charged and two former Volkswagen executives have pleaded guilty in the case and been sentenced to prison terms. One Italian citizen, former Audi manager Giovanni Pamio, is in Germany awaiting extradition. Six former Volkswagen executives charged, including Winterkorn, are believed to be in Germany and have avoided facing U.S. prosecutors. The September 2015 disclosure that VW had for at least six years intentionally cheated on emissions tests did massive damage to the company's reputation around the world and prompted massive compensation and vehicle refit costs. VW halted the sale of new diesels in the United States after the scandal.